On Saturday, January 20, 2018, more than 200 early education leaders and professionals attended Washington Area Women’s Foundation’s annual regional Early Care and Education Summit. The event, co-hosted by the Early Care and Education Funders Collaborative (ECEFC) and Montgomery College’s School of Education focused on the role of race and culture in improving early education systems. Participants attend workshops in English and Spanish by leading experts on a range of issues related to the pre-school to prison pipeline, improving quality care and strengthening the workforce, community engagement, working with diverse populations, kindergarten readiness, and ensuring the socio-emotional needs of young children, among other topics. They also engaged in discussions focused on creating early care and education policies that are reflective of the needs of families and communities. The Summit launched with an opening keynote presentation by the leadership of the Equity in Early Learning Initiative, a partnership of The Campagna Center, School Readiness Consulting, and Wonders Early Learning + Extended Day. Lindsey Allard Agnamba of School Readiness Consulting provided a historical perspective of the importance of race in early childhood education policy, with Tammy Mann of The Campagna Center and Joanne Hurt of Wonders Early Learning + Extended Day punctuating Lindsey’s points with stories from their own experiences working in the field. Participants had the opportunity to attend smaller workshops facilitated by local and national experts, including presenters from Bank Street College of Education, Children’s National Health System, Mary’s Center, Montgomery College, NAEYC, Naval District Washington Region, Northern Virginia Community College, School Readiness Consulting, Trinity Washington University, and Wonders Early Learning + Extended Day. The day closed with a panel discussing diversity in the early care and education field, with a focus on how early education systems can improve in their support of an inclusive workforce. Cemeré James of National Black Child Development Institute moderated the panel discussion featuring Stacie Burch of Anne Arundel Community College, Florence Kreisman of Mary’s Center, Marica Cox Mitchell of NAEYC, Sonia Prundeda-Hernandez of Montgomery College, and Mandy Sorge of National Governors Association. Cemeré and the panelists highlighted the significance of educators’ advocating for their own advancement and to inform decisions of policymakers that impact them and the children they serve. Review the Summit program book here. In 2016, Washington Area Women’s Foundation made a public commitment layering a racial equity lens on our work, on top of our existing gender and class equity lenses. To compliment The Women’s Foundation’s commitment, the ECEFC formally adopted a racial equity commitment into its work, as well. With this new consideration, the ECEFC did not only need to incorporate racial equity in how it considers its grantmaking, but across its full body of work, including its annual regional early care and education summit. In addition to deciding to make race and culture the Summit theme, the ECEFC made changes to the programming to ensure that early childhood educators, who are predominately women of color, had the opportunity attend, including holding it on a weekend and offering participation credit across Maryland, Virginia, and Washington, DC. Launched in 2008, as a multi-year, multi-million dollar collective investment effort, the ECEFC holds the distinction of being the only early care and education funders collaborative in the country that works on systems-change across state lines. Its mission is to increase the quality and capacity of, and access to, early care and education in the Washington area, with the goal of closing kindergarten readiness gaps throughout the region. The ECEFC is supported and directed by corporate funders and local and national foundations and staffed by The Women’s Foundation. Good Afternoon, my name is C. Nicole Mason, and I am the Vice President of Programs at the Washington Area Women’s Foundation, home to the Young Women’s Initiative–our city-wide effort to improve life outcomes and chances for young women and girls of color in the District. As a part of Young Women’s Initiative, I also facilitate the Young Women’s Advisory Council, a bi-weekly group made up of 21 young women and girls of color between the ages of 12-24 that reside in the City. Needless to say, I have a personal interest in making sure that every child regardless of her race, ethnicity or socioeconomic status is in the best position to succeed and have her social, emotional and educational needs met while in school, and on a daily basis. Currently, this is not the case. As you know, In-school disciplinary actions and suspension rates among Black and Latina girls and young women are alarmingly high compared to other girls in the District. Black girls are nine times more likely to receive at least one out-of-school suspension, compared to non-Black girls. Less than 0.2 percent of White, non-Hispanic girls in DC receive an out-of-school suspension. When the Student Fair Access to School Act of 2017 was introduced by Council Member Grosso, we at the Foundation believed it was an opportunity for the City to address glaring disparities in out-of-school suspensions, create uniform standards across District of Columbia Public Schools (DCPS), encourage positive approaches and the use of evidence-based and promising practices to discipline in schools, and to curb out-of-school suspensions for minor offenses. Passing the legislation would put the City on a path to increased educational parity and equity for the most vulnerable students in our system. When I discussed the bill with our Young Women’s Advisory Board, they were fully supportive of the legislation. Of the 21 girls on the Council, more than half reported that they had been suspended once or more; many for minor infractions ranging from dress code violations to talking back to a school official. Most of the young women that had been suspended believed they had very little recourse to dispute the suspension and struggled, in some instances, with the arbitrary enforcement of rules. One story from our meeting relayed by one of our Fellows was truly heartbreaking and strikes at the core of why I believe this legislation is so urgent and necessary. One of our Fellows, now a recent graduate of Spelman College in Atlanta, Georgia and current DCPS school teacher was suspended for bringing a knife to school when she was in the 12th grade. When she went through the metal detector at her school in the District, the alarm sounded and her backpack was searched. Upon further investigation, it was revealed that she was homeless, and worked nights at a local Burger King restaurant. Most nights she would get off work extremely late, and carried the knife for protection as she made her way from Burger King to the local shelter where she lived. She forgot to remove the knife from her backpack before school. Rather than expel her, she was given a 10-day suspension. I think we have to ask ourselves, was this just? Knowing the situation, could there have been an alternative that would have kept her in school and engaged? More importantly, how can we work to ensure that we are meeting the needs of students and not applying a one size fits all solution to a problem that is multi-layered and complex? I believe the Student Fair Access to School Act of 2017 helps us do just that. Thank you for this opportunity to submit this testimony. April 29th marks President Trump’s 100th day in office. 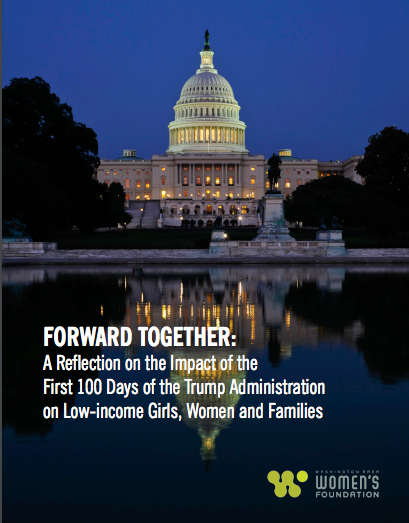 Washington Area Women’s Foundation releases a report that summarizes action impacting women and families. “According to the White House press office, the President has signed 30 executive orders, used the Congressional Review Act 13 times to review and overturn federal regulations that went into effect under the Obama Administration and enacted 28 laws during the first 100 days of his Administration. These actions include the revocation of the Fair Pay and Safe Workplaces Executive Order, a measure that strengthens protections against workplace discrimination and another order that, if it had gone into effect, would have limited immigration and travel to the United States for targeted groups. In addition to the legislative and executive branch actions that could create barriers for women and girls, the Administration’s appointees do not have a history of promoting women and girls. On January 31, 2017, the President nominated 10th Circuit Federal Judge Neil Gorsuch to the U.S. Supreme Court. In his rulings, Judge Gorsuch denied protections for pregnant women and sided with corporations in their efforts to deny women access to the full range of reproductive health care services. Judge Gorsuch was confirmed to the highest court in the land on April 7, 2017.